"I am not Kirk, Spock, Luke, Buck, Flash or Arthur frelling Dent. I'm Dorothy Gale from Kansas." "My name is John Crichton... an astronaut. Three years ago I got shot through a wormhole. I'm in a distant part of the universe aboard this living ship of escaped prisoners, my friends. I've made enemies. Powerful. Dangerous. Now all I want is to find a way home, to warn Earth. Look upward, and share... the wonders I have seen." Farscape is a Space Opera that ran from 1999 to 2003 on what was then the Sci-Fi Channel. It was produced by the Jim Henson Company, although co-funded by the network, and co-created by Rockne O'Bannon and Brian Henson. Production took place in Sydney, Australia, to take advantage of lower costs. 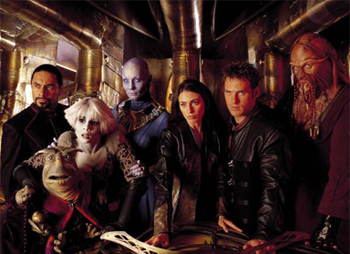 Canceled in 2003, Farscape was resurrected on the Sci-Fi Channel for a two-part miniseries that resolved the cliffhanger from season four and gave fans a condensed version of the planned plot for season five. While its premise began as a fairly standard Science Fiction show, Farscape quickly distinguished itself with a focus on complex, evolving characterizations, jaw-dropping plot twists and movie-quality special effects and cinematography. Several of the aliens went far beyond Rubber Forehead Aliens into the realm of Starfish Aliens, thanks to puppets or animatronics created by the Jim Henson Creature Shop. The show often subverted the cliches and tropes of standard television science fiction, and has been referred to as the "anti-Star Trek." The heroes tended to have more sordid backgrounds and bad habits than usual, and the clean, well-dressed military was often the antagonist. Actions had consequences, characters made stupid mistakes, innocent people died, and plans tended to go wrong. While not quite as arc-based as Babylon 5 or Lost, the series became less episodic as time wore on (this is especially true of Seasons 3 and 4). The series is also notable for its rapid turnover and numerous deaths of main characters, at least compared to most sci-fi series. In actuality, though, not all of those deaths actually stick. Farscape bears some resemblance to the '70s British series Blakes Seven, which was also centered around a group of escaped convicts challenging an evil dictatorship from their high-powered ship. Many B7 fans see the character, Grayza, as an acknowledgment of this, because of her strong resemblance to Servalan, B7's own Big Bad. The fact that actress Rebecca Riggs is an avowed fan of B7 doesn't hurt. In 2008, BOOM! Studios started publishing ongoing -- and canonical -- Farscape comics, from stories written by Rockne O'Bannon and scripted by Keith R.A. DeCandido and David Allan Mack. There were two ongoing series set post-Peacekeeper Wars, one following Moya's crew (Farscape) and one following Scorpius (Farscape: Scorpius), the spin-off since merged back into the ongoing story as of the War for the Uncharted Territories Story Arc, as well as a pre-PKW series following D'Argo. This series has its own recaps and Fetish Fuel page. This page was last edited on 3 February 2019, at 07:14.